This post contains information about the available pokemon IV breeding methods players can use to maximize their pokemon's potential. In Pokemon Ultra Sun and Moon, you have the option to breed Pokemon with perfect Individual Values (IV). These Pokemon have better overall stats and abilities compared to the ones you catch in the wild. In fact, competitive Pokemon players breed Pokemon with specific IVs to maximize its potential in battle. That said, here are some ways to breed Pokemon with perfect IVs. The first Pokemon IV breeding method is to get Power Items. These items are given to one parent Pokemon and when they breed, the baby Pokemon inherits one of the specific IVs from a certain stat, depending on what Power Item it is holding. During Pokemon IV breeding, the offspring will inherit 3 IVs at random from their parents. If you equip a parent Pokemon with a Power Item, it will pass on the specific IV to its offspring. However, only one parent Pokemon has to hold a Power Item in order for its IVs to be passed to its offspring. If the two Pokemon parents are holding a Power Weight, only one of the parents is guaranteed to pass on its IVs to their offspring. These Power Items can be obtained in the Battle Royal Dome, where they are acquired by exchanging BPs. Determine which Pokemon you want to breed. Have one of the parents whose IVs you want to be passed on hold one of the Power Item that corresponds to the desired stat (for example, if you want to pass on the HP IV of the parent Pokemon, have it hold the Power Weight). Have the other parent Pokemon hold the Everstone. Begin mass hatching eggs until it yields 31 IVs. If another hatched Pokémon has more 31 IVs than one of the parents, replace one of them with it. Have the Pokemon with more 31 IVs hold a Power Item, while the other will have the Everstone equipped. Repeat the above steps until at least (3) 31 IVs are obtained. The newly hatched Pokemon should be given a Destiny Knot while the other keeps the Everstone. The second Pokemon IV breeding method uses the Destiny Knot and Everstone. Similar to the Power Items method, the parent Pokemon that has the desired Nature are given the Everstone to hold, while the Parent Pokemon with the desired IVs should hold the Destiny Knot. Have the Parent Pokemon with the desired Nature to hold the Everstone. Have the Parent Pokemon with the desired IVs to hold the Destiny Knot. Let them breed and hatch the eggs. The final Pokemon IV breeding technique is called the Time Machine Method. In this iteration of the game, the Pokemon’s IVs are set whenever you save the game in front of the NPC holding the egg, so long as the parents are the same. This applies to each subsequent egg after you reject the first egg. Doing this lets you check which IVs the egg will inherit. For instance, after figuring out the Male and Female parent Rowlet’s IVs, replacing them with other Rowlets will not change their offspring’s IV arrangement. This is due to the fact that replacing the parent Pokemon with the same species will not change the IV arrangement. The same goes when you switch one of the parent Pokemon with Ditto, since Ditto can copy any Pokemon species. Using Ditto as a parent is useful for Pokemon IV breeding. Conversely, if you change the two Rowlet parents with two different Pokemon, like Pikipek and Rowlet, their IV arrangement will change. 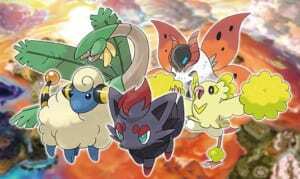 However, if you change the parent Pokemon of the same species with two other Pokemon of the same species (ex. Rowlet [M] and Rowlet [F] with Pikipek [M] and Pikipek [F] ), the IV placement will remain after resetting. List down the IVs of the primary Pokemon parents. Do not use Pokemon that have similar IV arrangements. The table below is an example of the parents IV arrangement. Choose one of the Pokemon parent and have it hold the Destiny Knot. Have it breed with another Pokemon of the same species. Hatch several eggs afterwards. Examine the IV of the newborn Pokemon to determine which IVs are passed on. The table below is an example of an IV arrangement for the hatched eggs. After determining which IVs are being passed on, reset the game. Remember which egg number whose IV arrangement you want is and replace the original parent Pokemon with the desired IVs. Take note of the table above to retain the IV arrangement chain and replace the original parent Pokemon with the compatible pairs. Hatch the egg number with your preferred IVs.